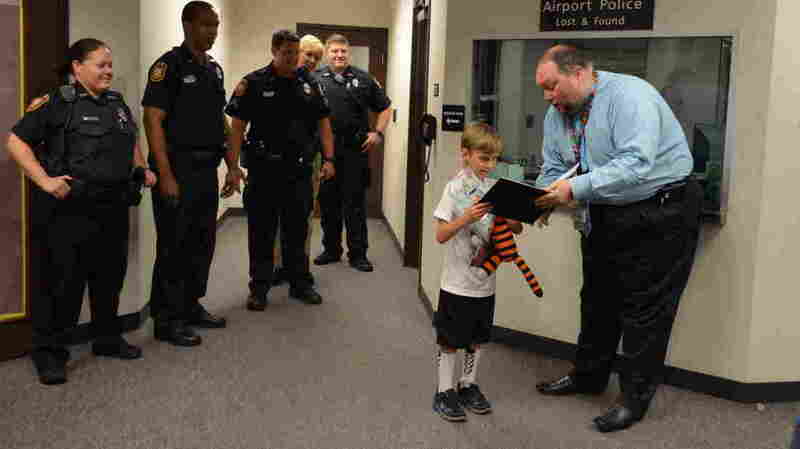 Boy Who Lost Stuffed Tiger At Airport Finds Tiger Stayed Very Busy : The Two-Way After he was found by a Tampa airport's janitorial crew, a stuffed tiger named Hobbes was taken out for some gelato and on a behind-the-scenes tour of the airport. Hobbes the tiger surveys the scene at Tampa International Airport, where he was briefly stranded. 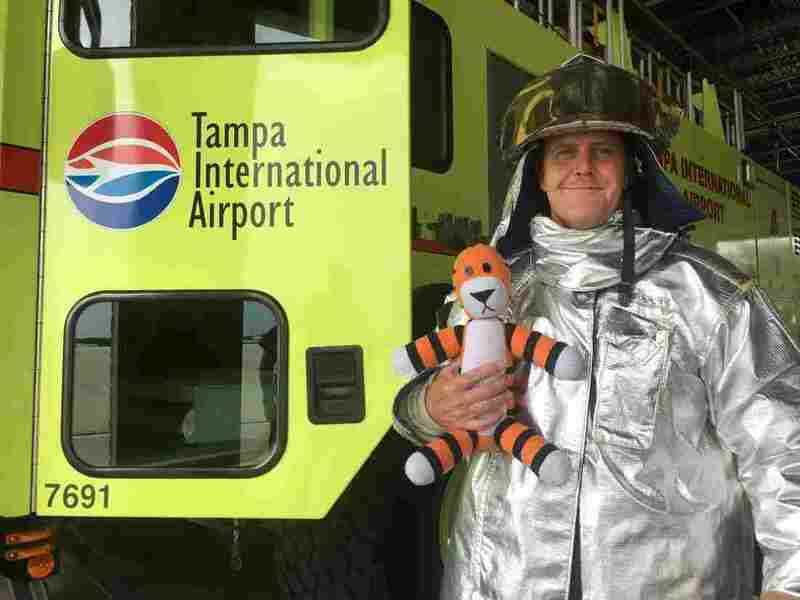 If a boy named Owen suspects his stuffed tiger named Hobbes has a secret life, the staff of Tampa International Airport won't disagree. 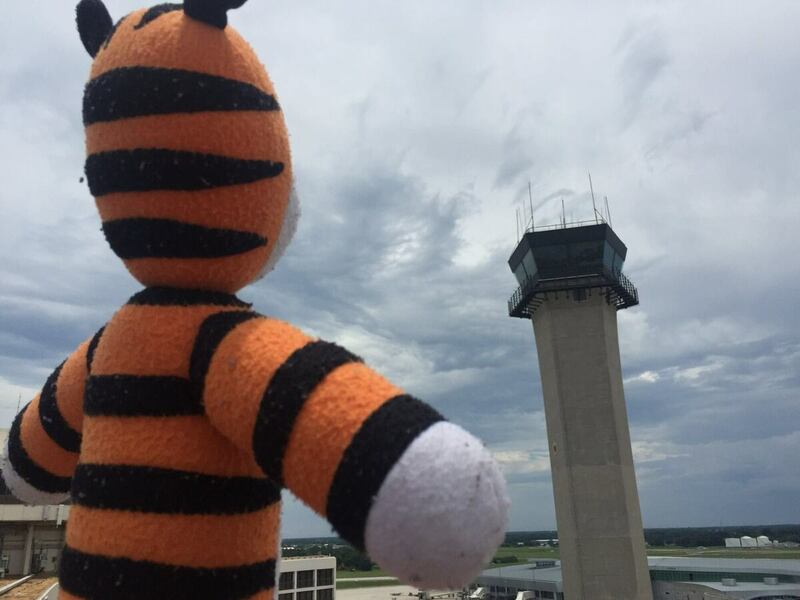 Owen recently lost Hobbes at the airport — and when he reclaimed the tiger, he also received photos of Hobbes touring the facility. Owen, 6, had flown from Florida to Texas. His mother, Amanda Lake, says that for much of the trip, Owen was preoccupied with whether his tiger was OK.
"Hobbes is one of a kind. He was made by hand by his aunt who lives in Houston," Lake tells the Tampa Bay Times. Not only was Hobbes OK, but after he was found by the airport's janitorial crew, the operations staff decided to take the tiger for some gelato and on behind-the-scenes tours of the airport. Hobbes also stopped by a hotel and played Jenga. Hobbes poses for a photo with a member of the airport's tarmac emergency crew. The tiger was safely reunited with his young owner — along with a photo album of his exploits. It was all the brainchild of Airport Operations Center Manager Tony D'Aiuto, who says he used a coupon to make the photo book at a drugstore. The story is drawing wide attention — after all, it's rather rare to see a heartwarming story emerge from an airport, particularly at the start of the summer travel season. "It was very, very sweet," Lake said in a news release from the airport. "We already told him over and over that Hobbes was on an adventure so it was nice to get back and show him that Hobbes really had been on an adventure. "Thank you to everyone at Tampa International Airport who took such great care of Hobbes. It was such a nice surprise." On the airport's Facebook post about the story, the top-rated comment is from a woman who wrote, "What a great story. What a great airport" — to which the airport replied, "Thanks mom!" Owen, 6, is reunited with his tiger, Hobbes. He had left the stuffed animal at the airport.